I assume this means we're getting new entries in them. Series that sold more than Lost Planet like Onimusha and Mega Man aren't listed, since you know, they're mostly dead these days. The other four are kind of obvious given they have clear development teams and recent successful entries. They wrote DMC with a capital M! DMC5 confirmed! Somebody at Capcom sure loves them some Lost Planet. I had no idea Lost Planet sold well. Not bad. Now bring a current gen LP and I'll be pretty happy. That's a hard one to swallow. Was Dead Rising 3 a big enough sucess for them? Nice, I like those games. I wish Dragons Dogma had a chance at a sequel though. No Mega Man Wonder how many that IP has sold? That's not a strong seller. Idiots. Give us Megaman and Dragons dogma. I still don't believe they will make another Lost Planet game. After the last game it's hard to believe there's much reason to return to that IP compared to making a new one for example. Watch all of them going online-only for their new strategy. Srsly too can't wait to see these brand on next-gen platforms, i'd like a Dragon's Dogma 2 too. Surely Mega Man has sold more than Lost Planet as a franchise? So Resident Evil 6 amounts for about 10% of all Residen Evil Sales. Not too shabby with 10+ games in the series. That poses the question if they really need to change the direction or reboot the series. Replace Lost Planet with Onimusha. Weird, I thought I remember reading that Dragon's Dogma did reasonably well for them. Maybe I just made that up in my head at some point along the way. Dragon's Dogma with online co-op would be pretty amazing. I hope they give it another chance down the line. If they insist on making more Lost Planet, they should probably let Vancouver make it. They should really post beside those how many of those title made profits and next to that whether they met the projected profits if any were made at all. List would shrink tremendously. Surprising to see Lost Planet on that list. (Not that I have an opinion on it, one way or the other!) More power to that franchise, then. Wonder where Devil May Cry will be taken next. Sequel to the reboot, Devil May Cry 5, or something else - entirely? Lost Planet 2 was incredible, but no Dino Crisis and Onimusha? lel. I really hope we get DmC 2, it was a fun game that I would like to see a sequel to. Bringing Lost Planet to Vancouver would be super interesting, although I really enjoyed Lost Planet 3. It was much better then it had any right to be given the developer pedigree. I freaking loved the original Lost Planet, I bought a 360 for that game. I hope the series gets a chance to go back to something more like that and the first game. I heard the 3rd wasn't as bad as people thought it'd be, but I need that freeform grapple! To be honest, I only ever played the demo of LP2, but I played it like 20 times. I suppose I'll be the first to point out the lack of Mega Man there. EDIT: You guys are too fast. Also, no Dragon's Dogma makes me a sad panda. I really hope there will be a sequel. Capcom cares more about Lost Planet than they do Megaman. Never change Capcom. real surprising not to see castlevania either. Devil May Cry 5 would be a great announcement to hear at E3! I'm also going to go out on a limb, and say the next Devil May Cry is coming out of Japan. Because of course it will. To be fair, Dragon's Dogma isn't a series yet. I heard it sold well for a new IP though, and Capcom was "pleased" with it's performance. That's Konami, or is this a joke I still haven't gotten? Dragon's Dogma, being only one entry and the lowest seller, probably didn't earn a position on here. Imo it means nothing, i just read it as a company's curriculum so they filled it with all the best sales they had. 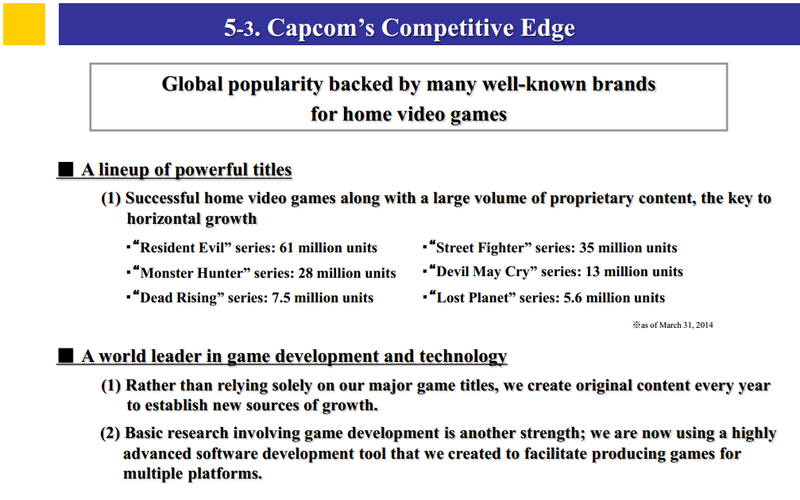 People commonly confuse Capcom and Konami. Although less so these days it seems. Was it worth it Capcpom? Got it, so it is a joke. I thought I saw something like it before, and no one else pointed it out, so I figured something must be up. Sad that Lost Planet is on the list and not Dino Crisis. Were that true, Mega Man should would presumably be listed, given it did 30 million. Onimusha is also at 8 million, so both of these outclass Lost Planet. I understand not listing Marvel vs. Capcom since they don't own that. From dozen of ips down to 6. This is just sad. Really strange that Metal Gear didn't make the list.